You might enjoy this story from the Pittsburgh Tribune-Review. It has a connection with RCA that I’ll explain at the end. When Lisa Spahr found a cache of letters in a trunk in a relatives’ home in York, she had no idea what she was looking at. They were baffling to her and her family. The letter, one of 70, was dated May 8, 1943. Robert M. Spahr was Lisa’s grandfather. The “Miss Spahr” in the letters was her great-grandmother. 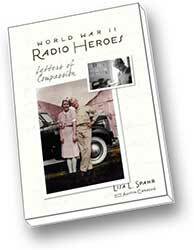 Spahr’s book “World War II Radio Heroes: Letters of Compassion” (Intrigue Publishing, $15.95) solves the puzzle of the letters she found two years ago. Spahr uncovered a network of ham radio enthusiasts who tracked German propaganda broadcasts, then informed the families of POWs that their loved ones were alive. The above letter was written by Flavius Jankauskas, then a teenager from Philadelphia. Lisa Spahr tracked down Jankauskas, who is still a ham radio enthusiast. He told her he sent the message out of a sense of duty to the country. But the radio operators also were going against a directive issued by President Franklin D. Roosevelt, that all shortwave communications were to cease because they were playing into the hands of German propagandist. The radio operators, torn between duty to country and a passion to inform the families, came up with a compromise. Thus, the letters that came from ham radio operators around the country. One woman in Ohio was so passionate about the project that she organized a listening schedule, so no broadcasts would be missed. Spahr never met her great-grandmother, and her grandfather died when she was 12. Spahr, 33, never had the chance to ask him about the impact of the letters. But she did track down a few families who received letters, along with Jankauskas and Mort Bardfield from Massachusetts, who was also a teenager during World War II. Both men enlisted in the military when they came of age. Regis Behe can be reached at rbehe@tribweb.com or 412-320-7990. Here’s the Radio Club connection: Mort’s son, Ed Bardfield, W1RES, is a Fellow and life member of RCA. And here’s something special: Mort, the New England director of the Old-Old Timers Club, has a web page that details his World War II shortwave and amateur radio experiences, continuing on to his career in broadcasting, then his life in the Caribbean and the consruction of a cellular telephone network there. You can visit the web page at www.w1uq.com. If you’re inclined to do so, you can meet the author, Lisa L. Spahr, at one of her booksignings. This entry was posted on Wednesday, December 26th, 2007 at 1:05 pm and is filed under RCA news. You can follow any responses to this entry through the RSS 2.0 feed. You can leave a response, or trackback from your own site. What a pleasant surprise to see this on your blog! Mort and Flavius have been real blessings to me since starting this project 2 years ago. I invite you and all of your readers to our Launch Party January 15th at The American Legion in Washington DC. We’ll have radios on hand from the era and hopefully educate people on the role of radio and operators both from the past and today.